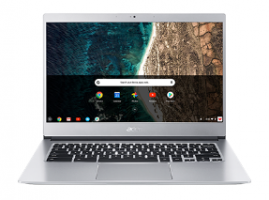 Acer Chromebook 514 Laptop comes with Chrome OS Operating System, Intel Celeron N3350 Dual-core (2 Core) processor ticking at 1.10 GHz base frequency clock rate, 4GB LPDDR4 Memory and 32GB EMMc SSD Solid State drive internal storage. Acer Chromebook 514 Laptop also has DTS Sound,Integrated stereo speakers, Acer True Vision web cam, Microphone, Full-size backlit island-style keyboard. The Laptop has 14.0 inch screen size, Height 0.7 x Width 12.7 x Depth 9.1 inches Physical Dimension and 3.31 lbs Weight and 3-cell Lithium Polymer (Li-Polymer) 3920 mAh battery.